Last Saturday, Gamezebo published an article I wrote on transitioning from video games to board games. It was pretty well-received, despite some initial naysayers. I was disappointed to see that but we’re on good terms now. One thing I really want to work into my spy game is some form of Capture the Flag (CTF). In addition to my many CTF games as a kid, I played Halo’s CTF mode a ton in my first couple years of college. It’s a simple game that encourages deep strategy. Over the weekend, I had a thought: Halo utilizes more than just CTF in its multiplayer modes. The Halo franchise has King of the Hill, Territories, and a bunch of others. What if I looked into these to inspire my missions? I pulled up the latest Halo 4 modes and went to work. In little time I had much more interesting missions than the basic ones in my prototype. Why not take advantage of over 10 years of design work? The next day we playtested the new missions along with a new, larger board for the spies to run around on. Along with this, we now track every mission that each playercould have beside the game board. This keeps track of players’ scores, and supplies players with a place to deduce what their opponent’s mission might be. We had great results, because now the missions can be easily multi-tasked. Players are able to act like they’re doing one mission while they do another “in the background.” For example, a player can capture his/her opponent’s flag while simultaneously looking through buildings for mission-specific items. Juking out your opponent makes the game feel much more like espionage. Deception is a key strategy now. We also playtested an extremely different version of the game, which took out money and objectives completely in favor of focusing completely on missions. While this game was severely imbalanced, it showed the promise in boiling down the game to focus the most on missions. As my friend told me before I could see it for myself, the core of the game is the missions. Every mechanic should support them. If a mechanic does not interact with missions, it should be removed. I finally booked my flight and bought my ticket to the GAMA Trade Show in March (right before GDC). I’m looking forward to meeting a bunch of industry folks and starting to get a better handle on the publishing side of things. Later in the week we tried out a different method of spies attacking each other. Instead of killing immediately on a successful die roll, we tried out “one hit to injure, two hits to kill.” The intention was to make killing harder/more rewarding and avoid putting a catch-up mechanic into the game, but it just made die rolls a lot less exciting. The number 6 lost its legendary status as The Lethal Number. So we nixed this idea. But I do have an idea for a kill-related catch-up mechanic where spies can recover other spies after they are struck (CTF inspiration again!). The remaining days this week were contemplative. They were the kind of days where I think forever and not much gets settled. All I had to show were some notes on a scratch-pad Excel sheet. That’s always rough to see since I’m so concerned about using my time effectively, but like I’ve said in past posts, I must accept it as part of the process. 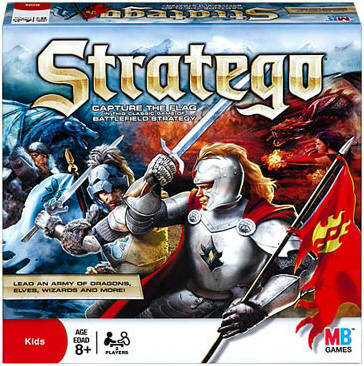 This proves itself over and over again; I now have a new high-level pitch for my game: Stratego meets Heroscape. That pitch will be proven out next week in prototyping. On a final minor-but-fun note, I finally figured out a way for spies to cloak themselves. They will use some form of the Robo Rally movement mechanic, where you cue up directions for your spy to move in and then show them to the other player all at once (instead of moving one space at a time, which clearly shows your trajectory). I’m looking forward to trying this out in concert with the other rules.